This is Carl the Helpful. 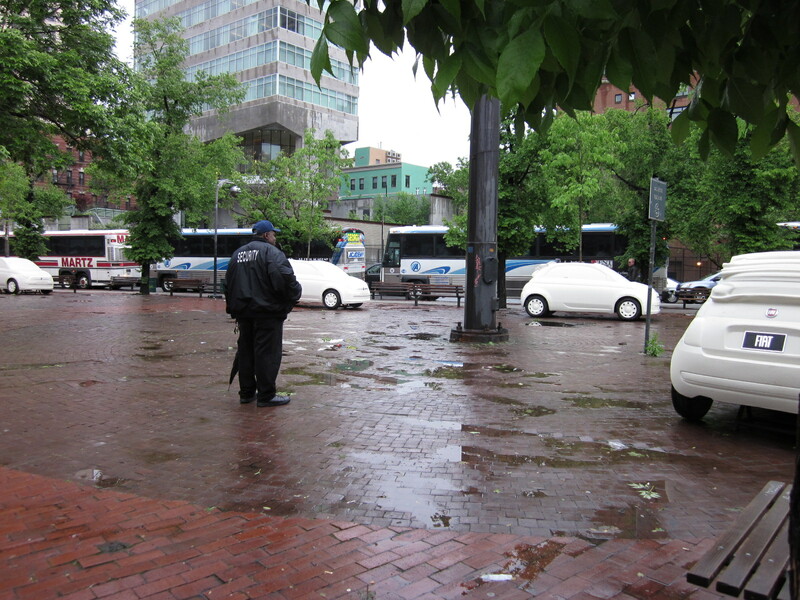 He is currently working as a security guard this wet and rainy week in Duarte Square located on Avenue of the Americas at Canal Street in lower Manhattan. He’s one of the guards making sure that nothing stupid happens to an installation by designer and architect, Fabio Novembre, that was originally called “Per fare un albero” (“To make a tree”) when it was first displayed in Milan in 2009. This installation has also visited Rome, Paris and Madrid. Fabio Novembre and friends; just another day at the office. When I walked past it with Coco on a recent Tuesday night, I nearly threw out my neck when I saw it. Me: Hey Coco, look at that! 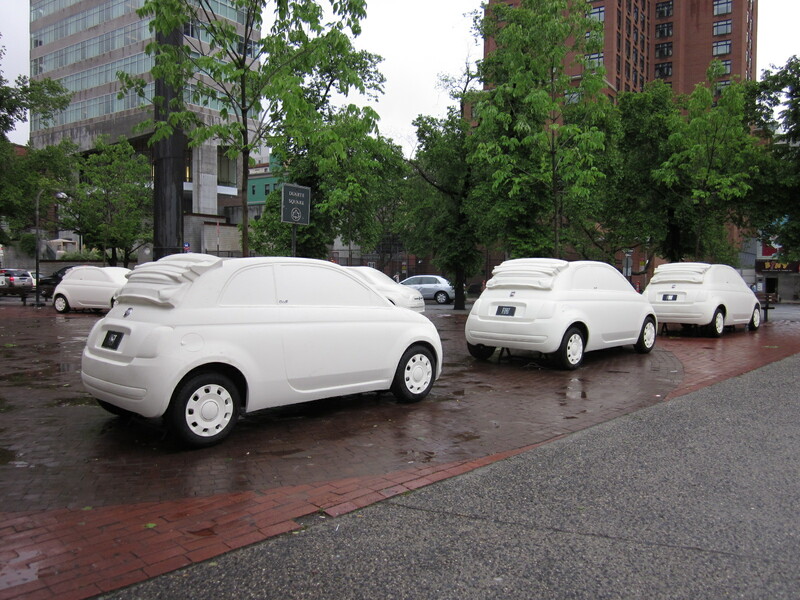 It’s the new little Fiats! Coco: Trees are growing out of them! 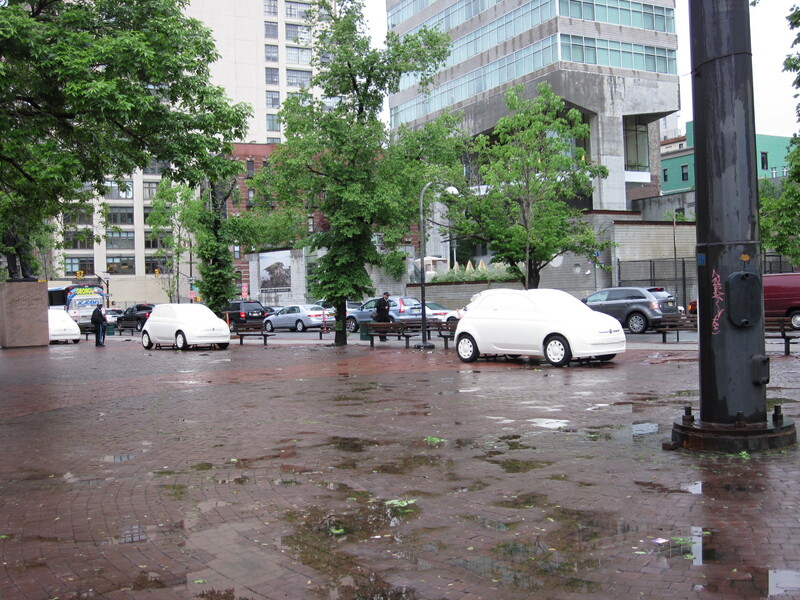 Cars as pear tree planters. Very cool. A tree grows in Fiat. 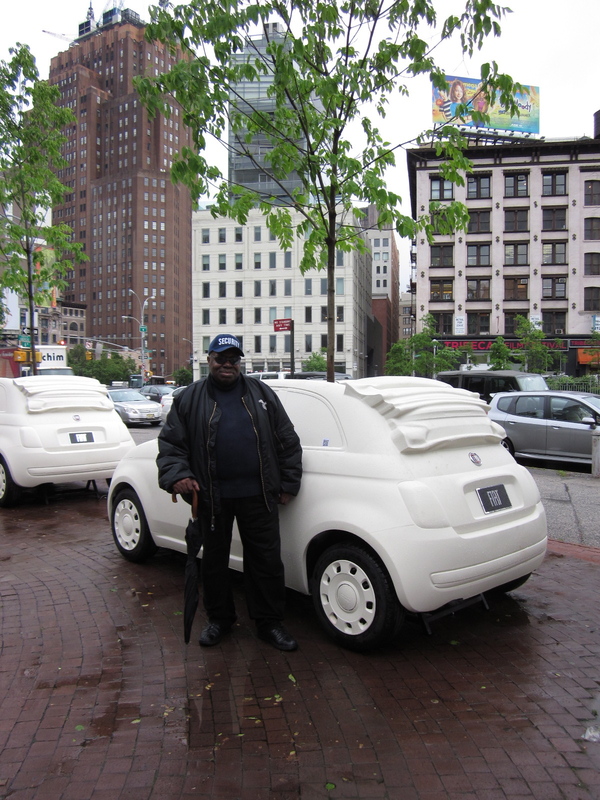 When we got up front and personal with the fiberglass replicas of this whimsical little car, the Fiat 500C, I experienced a Proustian-style sense memory of the white almond wedding favors my mother and grandmother would spend days of their lives wrapping in tulle. My only participation in this ritual was to taste-test a few of the almonds. Since this installation was guarded, I resisted the urge to take a bite out of a fender. That would surely classify as “something stupid” requiring Carl the Helpful to spring into action. Carl the Helpful: It’s back by popular demand. 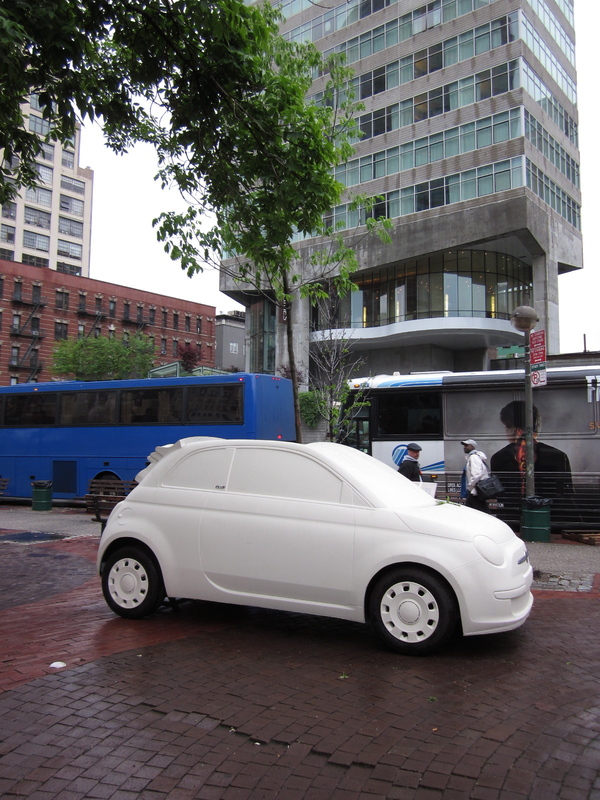 Apparently, it was first displayed in Duarte Square in April during the New York Auto Show. I noticed that there was an empty space where another car could have fit. Sixth Avenue side car-size hole. Me: Shouldn’t there be another car there? Carl the Helpful: Yeah. Last month, there were eight. Now there’re seven. Me: What happened to the eighth one? Carl the Helpful: I don’t know. When they came back, they only had seven of them. Maybe some fat cat New Yorker like Donald Trump ate it. Carl told me that this installation is going to be removed after this Friday, but he would not mind if the run is extended yet again. Even though he’s been standing in the rain, he likes this gig. Carl the Helpful on guard duty. Once the cars go, the trees will stay. They’re part of the New York City Department of Parks and Recreation and New York Restoration Project’s Million Trees NYC campaign. Unfortunately, I don’t think Carl will be tagged to guard the trees. Fiat has posted a music video featuring Vivaldi on YouTube promoting the relaunch of the 2012 version of this classic compact car. The beautiful people gracing it are sold separately. 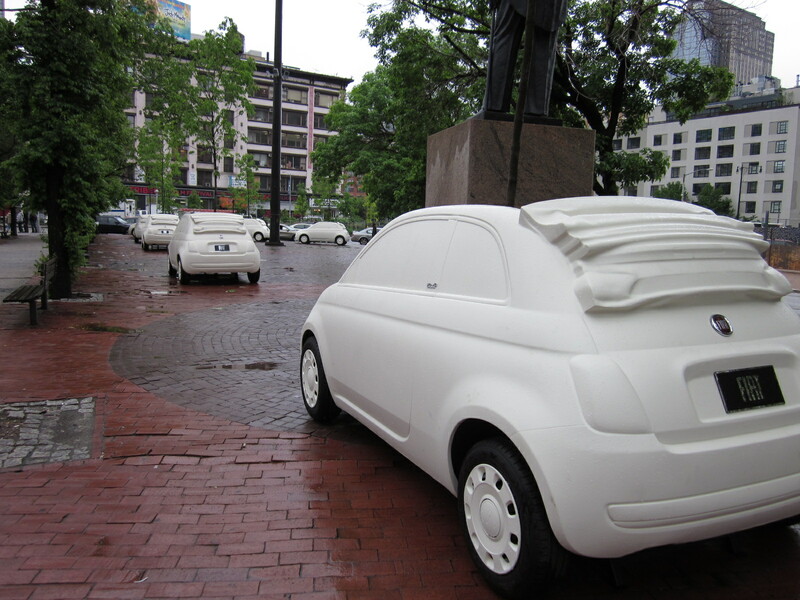 This entry was posted in Humor and tagged art, duarte square, fabio novembre, fiat 500c. Bookmark the permalink.